Pasta and comfort are a match made in heaven. We all love it and we all have to stop ourselves from polishing off a couple plates. Its fun to try new things and homemade pasta falls into that realm, it can be very comforting knowing where your food comes from and that each ingredient is known through out the process. This recipe for homemade pasta is simple and delicious, makes enough to make raviolis or more than enough for your own spaghetti. The shape of your choice and your favorite sauce, you will be all set to impress and fill your belly with the king of comfort foods. Enjoy! In a food processor blend together The Vegg, Ener-G, and 3/4 cup water until combined together and mixed throughout. Set aside to use when flour is ready. In a Kitchen Aid mixer fitted with a dough hook (this could also be done by hand on your counter top), Pour 2 cups of flour into the mixer with salt and mix to combine. Once flour and salt are combined, slowly mix in half of your "egg" mixture and blend scrapping down the sides a bit. Then add in the rest of your "egg" mixture and combine until it forms a ball (scraping bottom and sides as needed). This mixture is still going to be tacky and not fully together (with regular flour). You can now add water and flour as needed. I found that 1/4 cup water add brings the mixture together and 1 Tbsp flour makes the dough soft and silky. The dough shouldn't stick to the sides of the bowl or your fingers. Add more or less flour & water to get this consistency. Remove the dough and place it in plastic wrap and then the refrigerator if you want to use it later. For immediate use or after refrigeration place dough onto well flours counter or cutting board with a damp towel over it and let it rest for around 45 minutes. Uncover your towel covered dough and re-flour your work service. 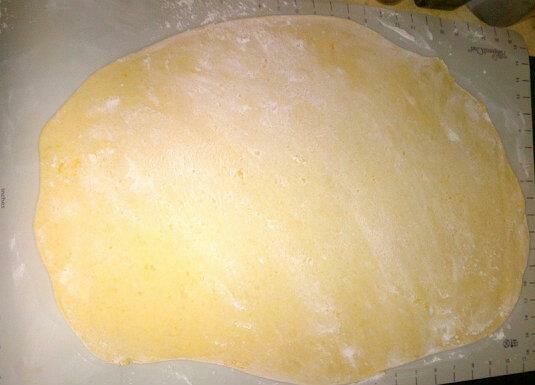 Place dough on this re-floured surface and with a floured rolling pin, flatten it out. You want to get the dough as thin as possible, so keep using the rolling pin to work it until you achieve this. Flour as needed throughout. At this point you can use the dough to make any shape of pasta you desire. This could be a great ravioli dough or with a pizza cutter or pasta machine, cut into regular spaghetti and cook in salted and oiled boiling water for 3 to 4 minutes until cooked (the pasta will float). Enjoy with your favorite sauce and ingredients. Enjoy!